Why you need to check out 'Witch Hammer' – AiPT! There are plenty of reasons to check out ‘Witch Hammer’. Witch Hammer from Cullen Bunn and Dalibor Talajic is a horror mystery story that takes the best elements of a detective story and adds elements of the supernatural. 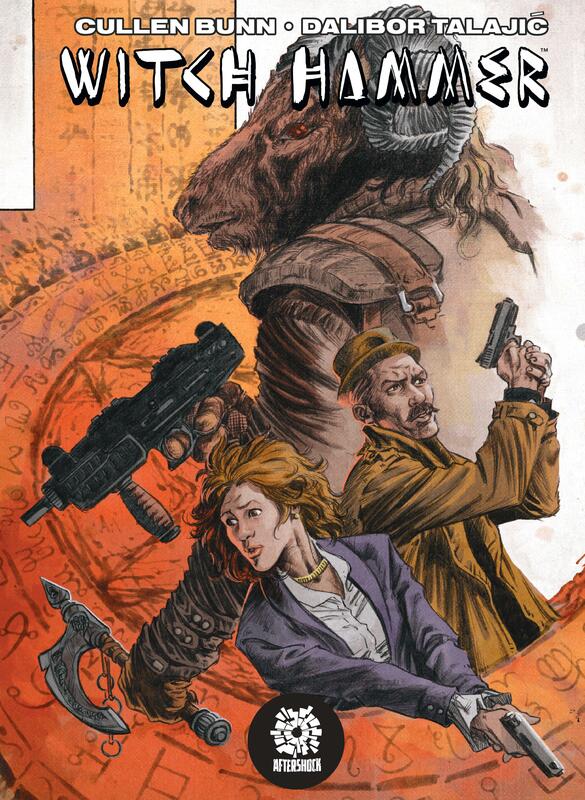 Incredibly violent, the AfterShock comic release is about two investigators who are on the trail of a person who has gone on a killing spree. All the victims have a common thread that makes the investigators wonder if the killer may be doing the right thing. Here are some reasons to place Witch Hammer on your must-read list. While Witch Hammer has not invented an entirely new genre, it has taken the best elements from a familiar one. Detective stories have remained popular for centuries because they play into a basic human feeling: curiosity. Like any good murder mystery, Witch Hammer does not just have readers asking who the killer is, but why are they targeting their victims. Throw in elements of witchcraft, a killer wearing a goat head, and a whole lot of blood and you have yourself a frightening mystery. Witch Hammer does not get past the first page before confronting its readers with a shockingly violent scene. This proves to just be a harbinger is what to come as the comic is filled with bloody acts of violence. Very few pages in the book fail to make liberal use of the color red. Even though though the violence is over the top, the witchcraft is played as straight. Sure, there are transformations, rituals, and demons, but they never overpower the story. Witch Hammer is a detective story, first and foremost. There may supernatural acts surrounding the plot but it is always clear what the focus is. “Beauty is in the eye of the beholder” may have never been more apt. Beauty is traditionally used to describe sunsets or landscapes. Rarely is it used to describe acts of vicious barbarism. Yet, in all its ugliness, Witch Hammer is beautiful. Dalibor Talajic’s art tells the story of the comic perfectly. It’s moody and emotional and creates a tone. The action scenes are also very well done, and Sebastijan Camagajevac’s color work impresses. Just like the best stories are the ones that make us think, the best villains are the ones who can make a logical case for the vile acts they are committing. Witch Hammer does a great job of giving its readers both. The story will make you realize how fluid right and wrong can sometimes be. It will also make you wonder if there may be some situations where two wrongs may make a right. It never justifies murder or bloody revenge, but as the protagonists of the story second guess themselves, you may find yourself doing the same thing. Witch Hammer may not seem like it is anything our of the ordinary. On the surface, it seems like another murder mystery. The only difference is it adds elements of the supernatural. The comic quickly sets itself apart from similar stories with its great art and examination of the murderer’s motives. Witch Hammer is an entertaining read that goes beyond a normal murder mystery. A gritty crime drama with a supernatural twist, 'Witch Hammer' is a violent ride that will keep readers asking, "what's next?"